In its 2015 Acura TLX review, Kelley Blue Book finds, "The TLX is the definition of smart luxury if you value the driving experience and appreciate Acura's cutting edge technologies like 4-wheel steering or Super Handling All-Wheel Drive over the prestige bestowed by having a European badge on your car's nose." The TLX is a car that blends excellent driving dynamics and quiet comfort with technological superiority. It also delivers excellent fuel mileage with either engine option, making it a great value. Slide into a 2015 Acura TLX in Peoria. The interior is modern and functional. Soft-touch materials, wood and aluminum accents add an upscale feel. The attractive and easy-to-read instrument cluster and dual-screen center stack provide a thoroughly modern aesthetic. The comfortable front seats are well-bolstered and the split-bench rear seat easily accommodates three adults. The TLX comes with a choice of two engines: a 2.4-liter four that delivers 206 horses, or a 290-horsepower V-6. This is a rare instance in which taking the smaller engine doesn't mean settling. This is because it's mated with an 8-speed dual-clutch transmission mated to a torque converter. You will find the 2.4L to be eager and able. Regardless of engine or powertrain, the TLX is an exceptional highway cruiser. It glides down the road with a silence and demeanor more often associated with cars bearing European badges and costing many thousands more. The TLX is certainly one of the quietest vehicles in the segment and may just be the quietest ever. In its 2015 Acura TLX review and road-test, Autoblog wrote, "After a few hours of trying to expose a weakness in the ride, I gave up and simply enjoyed the serenity - the TLX will make its owners look forward to the daily commute, whether three miles or three hours." Of course, Acura's vaunted safety-consciousness is put to work in the TLX as well. The Insurance Institute for Highway Safety (IIHS) rates the TLX a Top Safety Pick+. Among the standard safety features are a rear-view camera with dynamic guidelines, seven airbags, traction and stability control, anti-lock braking, brake assist, LED daytime running lights, and more. 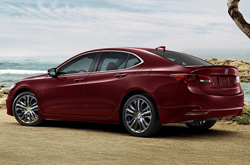 Test-drive the 2015 Acura TLX in Peoria. You'll find it is an attractive vehicle with an accommodating cabin, comfortable ride, sporty-feeling yet predictable handling, generous standard features, a strong suite of safety tech, excellent reliability and great fuel economy.